The demands placed on John Singer Sargent by his unparalleled success as a painter of Gilded Age portraits on both sides of the Atlantic began to tire him soon after the turn of the 20th century. In 1907–1908 he declared that he was "shutting up shop in the portrait line" to focus on landscapes, informal figure studies (including Nonchaloir [Repose], 1911, National Gallery of Art), and mural paintings. 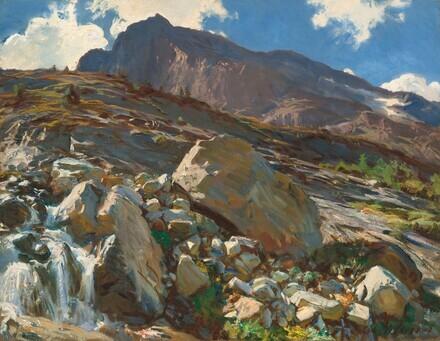 The artist undertook his landscape and figure paintings in oils and watercolors on many leisure visits to picturesque locales with friends and relatives, including this great Alpine pass in Switzerland near the border of Italy. He probably visited and sketched the view depicted in Simplon Pass as early as 1904, and returned for extended visits in 1909, 1910, and 1911. More than simply a document of the distinctive silhouette of the Hübschhorn and its surroundings, the view is a study of the clear Alpine light and air on the rocky terrain. The seemingly infinite variety of brushwork that endowed Sargent's vibrant portraits also enlivens this landscape (and others like it), describing the rushing stream at left, the colorful vegetation, and the dazzling sunlight sweeping across the foreground. The darker, drily brushed middle ground sets off the majestic peak. Here, too, light and shade define strong masses; while the mountain is mostly in deep shadow, passages of mauve emphasize its steep face. Thin, hazy clouds and pockets of snow connect its long slope to the brilliant sky above, which in turn harkens back to the sunlit foreground. Sargent's deft manipulation of the painting's registers did not go unnoticed. When wealthy Ohio industrialist James Parmelee lent the painting to the Corcoran Gallery of Art in 1914, one critic deemed the canvas "brilliant and self-assured . . . [the artist] has outdone himself in juggling with perspective, and [gives] the result a look of spontaneous unconcern." Purchased 1912 from the artist by (M. Knoedler & Co., London); purchased 1912 by James Parmelee, Washington; his widow, Alice Maury Parmelee; bequest 1941 to the Corcoran Gallery of Art, Washington; acquired 2014 by the National Gallery of Art. Fifth Exhibition: Oil Paintings by Contemporary American Artists, Corcoran Gallery of Art, Washington, 1915, no. 43. Probably [Exhibition of French and American Paintings], Doll and Richards, New York, 1943. Expatriates: Whistler, Cassatt, Sargent, Munson-Williams-Proctor Institute, Utica, 1953, no. 35. The Private World of John Singer Sargent, Corcoran Gallery of Art, Washington; Cleveland Museum of Art; Worcester Art Museum; Munson-Williams-Proctor Institute, Utica, 1964-1965, no. 81. Seventy-five Masterworks: An Exhibition in Honor of the Seventy-fifth Anniversary of the Portland Art Association, 1892-1967, Portland Art Museum, Oregon, 1967-1968, no. 8. The American Landscape Tradition, Corcoran Gallery of Art, Washington, 31 January - 31 August 1978, unpublished checklist. John Singer Sargent at the Corcoran, Corcoran Gallery of Art, Washington, 28 June - 2 October 1983, unpublished checklist. Sargent: The Late Landscapes, Isabella Stewart Gardner Museum, Boston, 1999, no. 5. Sargent and Italy, Palazzo dei Diamanti, Ferrara; Los Angeles County Museum of Art; Denver Art Museum, 2002-2003, unnumbered catalogue. Encouraging American Genius: Master Paintings from the Corcoran Gallery of Art, Corcoran Gallery of Art, Washington; Museum of Fine Arts, Houston; Parrish Art Museum, Southampton; Mint Museum of Art, Charlotte; John and Mable Ringling Museum of Art, Sarasota, 2005-2007, checklist no. 69. Corcoran Gallery of Art. Handbook of the American Paintings in the Collection of the Corcoran Gallery of Art. Washington, 1947: 62. Ormond, Richard, and Elaine Kilmurray. John Singer Sargent: Figures and Landscapes, 1908-1913. The Complete Paintings, Volume VIII. New Haven and London, 2014: no. 1584, repro. Simpson, Marc. "John Singer Sargent, Simplon Pass." In Corcoran Gallery of Art: American Paintings to 1945. Edited by Sarah Cash. Washington, 2011: 36, 204-205, 277-278, repro.